Had quite the double feature last night. Started with one of the grandest epics in the history of cinema, LAWRENCE OF ARABIA, and finished with a small, personal indie film called THIS THING WITH SARAH. I would like to stake claim to being the first person ever to watch those two movies in that particular order. 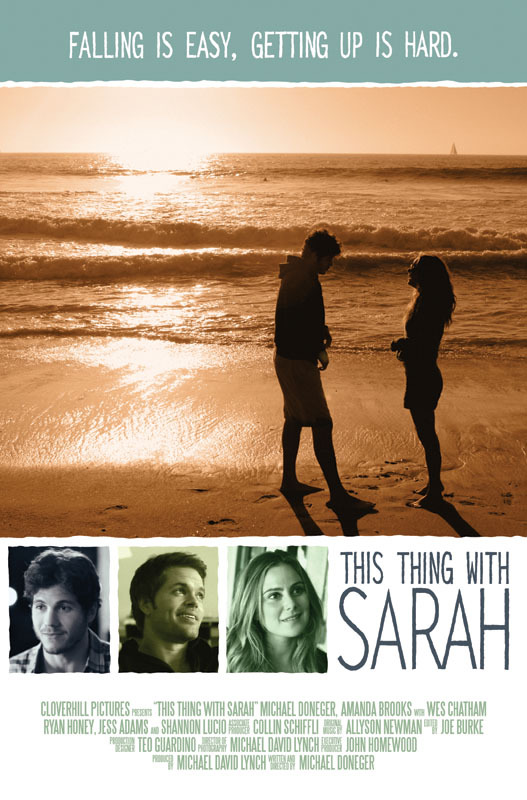 I watched THIS THING WITH SARAH (2013) on 7.14.14. It was my first viewing of the film. Devin (Michael Doneger) opens the movie getting dumped, via text, by his girlfriend of five years, Casey (Jess Adams). His super-bro roommate, successful actor Ethan (Wes Chatham), lays down the five rules for getting over someone. The fifth, naturally, is to have a rebound relationship. Devin meets Sarah (Amanda Brooks), who is happy to oblige. They start a relationship which is not, no matter how much they go out, a relationship. Neither is allowed to fall for the other. Guess what happens. I put this movie on to be background as I did some stuff around the house. Only, once I started it up on Amazon Prime, I never got up from the computer. I wasn’t sure if I particularly liked it for the first ten minutes. We were getting a movie written, directed, and starring Michael Doneger in which his character is a struggling screenwriter. Seemed a little too autobiographical to me. Felt like a bit of a vanity project, and I HATE that term. But what Doneger does, here, is really smart for several reasons. First, his Devin is not a perfect guy. He can be negative, he can be stubborn, he outright asks a girl to be his rebound, and he is certainly hypocritical (of course, the biggest reveal of his hypocritical nature is around falling in love, so it’s not like he’s a total jerk). Devin may or may not be a great writer. He has a manager, a terrible one, who tells him he is good sometimes. Sarah likes one of his scripts. But he hasn’t really done or sold anything. The one thing he writes which looks like it is going to go somewhere bounces around but doesn’t get sold. He has no job, he lives off his roommate, and he lacks motivation. This is where I have to step in for a moment. I intentionally avoid getting personal when writing these reviews, lest I devolve into a sort of Harry Knowles type site where everything I post is related to some TV show I saw on 16mm when I was a kid and how that qualifies my position vis-a-vis a particular film. But, well, I can’t help it. I moved to Los Angeles when I was 25. I worked in some TV production and worked in a talent agency. I actually did quite a bit of coverage for scripts while I was there, meaning I would read a script and give notes to the agent and recommend whether to read a script or not. I understand the game out there in that I lived it for a bit. So, I found a certain kinship with Devin (and Michael Doneger by proxy) because I found so much truth in his struggle. While the core of this film is a love story, it is also really about making choices. A major struggle Devin has in this film is the societal need to get a job and pay your bills versus the emotional need to be a writer. It is a struggle I personally fought and still do. I work the 9-5, so I did’t achieve the ideal put out in this film. I still get to write, both through this blog and in writing plays for high school students, but I willingly gave up the struggle in order to have a family and try and achieve some modicum of consistency for them. Yet, the message in THIS THING WITH SARAH is a very strong one. If you are a kid who is thinking about going for it, you have to go for it. You have to give it that shot. I don’t regret moving to LA, and I don’t regret moving back. I would have regretted not ever going out there and finding out that I didn’t want to live the rest of my life there. I would have regretted never trying. But, I have digressed a bit much. What really works for THIS THING WITH SARAH is both Doneger’s honesty with himself and his chemistry with Amanda Brooks. This is not a perfect film by any means, but what is? The manager character (Ryan Honey) is a bit cliched even by Hollywood standards. The film does not like or trust managers, and I am sure that was born from a very real experience Doneger had. Also, the roommate character being in an obvious TWILIGHT knock off (up to and including the same font on the posters) cheapens that story-line a little bit. Doneger went for some easy laughs about the vampire genre, but it both dates the movie prematurely and it may have reduced the ability to at least hint at the similar struggles an actor has. Lastly, some of the shots get REAL tight. Doneger does a good job of handling the directing duties while also playing the lead, but sometimes the result is like one where he spits out some food, only there was never any establishing shot, so it looks like he is spitting food out on Sarah’s floor. I’m sure there was a sink there, the audience just never got to see it. But those are minor points in a movie I overwhelmingly liked. The use of pop-up bubbles for texts was a really smart device to handle the problem of how to show who is texting what. More importantly, the film’s dialogue is usually sharp. It may become a bit too contrived in some of the Ethan/Devin conversations, but most of it feels lifted from Doneger’s real-life conversations which he wrote down in a notebook and then transcribed into his screenplay. This feels especially true with some of the set-up jokes, like the one about a ‘periscope’. This isn’t a knock, it gives the entire thing a very organic and human feel. So, look, this is a movie which spoke to me on a personal level. It is an endearing indie film about relationships and other struggles. The lead two actors are very good, the writing is solid, and the production is filmed with earnest love. I sat down to watch a distraction, and came away with a bunch of respect for this movie. ~ by johnlink00 on July 15, 2014.